A Windows system's DSDT table root bridge definition (ACPI PNP0A08 or PNP0A03) is usually confined to a reserved 32-bit space (under 4GB) budgetted to be large enough to host the notebook's PCIe devices. A watermark TOLUD value is then set and locked in the system firmware. Windows OS honors the root bridge definition and will allocate PCIe devices within it. macOS ignores the root bridge constraints as too does Linux when booted with the 'pci=noCRS' parameter. Neither of those OS require a DSDT override and can allocate freely in the huge 64-bit PCIe address space. When retrofitting a eGPU, an error 12 (This device cannot find enough free resources that it can use) can occur against an eGPU in Windows' device manager making it inoperable. This can indicate there is insufficient 32-bit addressing space available to host the eGPU. An eGPU requires a relatively large PCIe config space to allocate into. Decreasing TOLUD by reducing RAM to 2GB offers a somewhat impractical workaround. Rather, the definitive solution is below. macOS users: refer instead to Mikeal's post that covers these steps titled Windows 10 - Clover DSDT memory override [UEFI Windows on Macbooks only]. ii. Copy WDK's ASL compiler into the c:\dsdt directory. Do this by opening Command Prompt (run as administrator) and then copy-and-paste the commands below. set 64bit_OS_asl="C:\Program Files (x86)\Windows Kits\10\Tools\x64\ACPIVerify\asl.exe"
set 32bit_OS_asl="C:\Program Files (x86)\Windows Kits\10\Tools\x86\ACPIVerify\asl.exe"
iii. Dump your ACPI tables to disk files (dsdt.asl and dsdt.dat) with these commands at Command Prompt (run as administrator). The created dsdt.asl is copied here as dsdt-modified.asl which is used later on to make our required modifications. - For systems other than Lenovo, use the Intel method as their DSDT usually has an Intel creation signature. - Lenovo Thinkpad X220, T420, W530, T540P and likely other 2nd-4th gen i-core Lenovo Thinkpad systems are known to require the Microsoft method . The Intel method causes a "ACPI BIOS ERROR" on Windows bootup there. i. Save this >> refs.txt file << to your c:\dsdt folder. What is it used for? From tonymacx86: The iasl disassembler will attempt to guess the number of arguments [for unresolved symbols not defined in any file] but often guesses poorly. You can correct it by providing the external declarations in a refs.txt text file. It contains some common (and not so common) missing symbols . . .
ii. From the Command Prompt (admin), decompile dsdt.dat as dsdt.dsl . The refs.txt file is used here. dsdt.dsl is then copied as dsdt-modified.dsl on which we'll make the required changes on. iii. 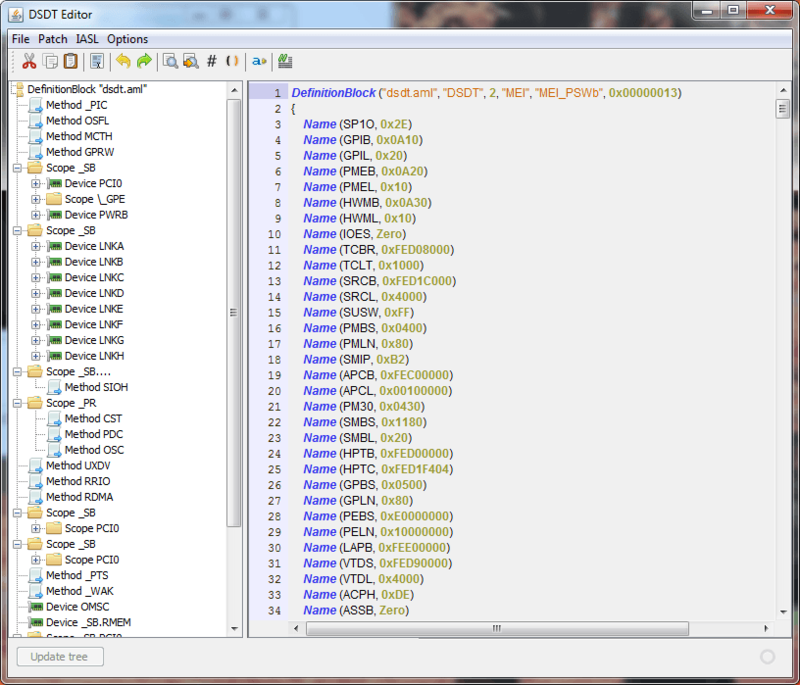 With Notepad++, open the resultant c:\dsdt\dsdt-modified.dsl file and search for ResourceProducer. Beneath it will be a series of "DWordMemory" resource entries. Under the last DWordMemory entry in that area, typically above the _CRS method, add a 'QWordMemory' (64-bit) entry as shown in red below. The range chosen is in the 36-bit range (< 64GB) to maintain compatibility with PAE-capable 32-bit Windows. A location above 48GB was chosen to alleviate issues with 32GB equipped systems. Here we use between 48.5GB to 56.25GB. Once systems start shipping with 64GB of RAM, this will need to be revised to use a 64-bit address. iv. Create a dsdt-modified.aml file . The '-ve' disables warning messages. It is unlikely this will succeed first time as the compiler is very strict. Errors reported will need to be looked at with Notepad++ on the line they occur on. Search for a unique error keyword from your dsdt-modified.dsl error line within dsdt-modified.asl (it may look a bit different) and the just swap the lines above/below into your dsdt-modified.dsl file and compile. This was sufficient to get a Dell XPS 9350, Dell E6540, 2016 15" Macbook Pro DSDT override all done perfectly. If stuck then see eGPU.io's public pre-compiled DSDT repository for various systems. If one exists for your system then can download it along with Winmerge to merge the file changes into your dsdt-modified.dsl work file. There are also other fixes like described at [Guide] Patching LAPTOP DSDT/SSDTs (tonymacx86). Consider also asking for guidance at the DSDT-centric tonymacx86.com DSDT forums . Then try compiling your DSDT again. v . Proceed to Step 2 to load your dsdt-modified.aml file. i. With Notepad++, find the working area in your c:\dsdt\dsdt-modified.asl file as shown in screenshots below. In that area, make the following two edits. These are annonated in those screenshots. EDIT 2: replace "0x79, 0x00" in the hex table end with the following 46 hex values, also ending with "0x79, 0x00". This adds the same 36-bit QWordMemory resource entry shown in the Intel method but as a hex table. This will almost certainly fail to generate a dsdt-modified.aml on your first compile attempt due to to error lines requiring further editting of your dsdt-modified.asl file, like the ones below (further example here), followed by another compile attempt. A successful compilation with many warnings is OK.
iii. Open c:\dsdt with Windows explorer. Compare the size of your created dsdt-modified.aml file against the memory dumped dsdt.dat. They should be within +/- 10% of each other in size. If not, repeat the above process to make sure no mistakes were made. A HP Elitebook 8440P saw the generated dsdt-modified.aml being only 15% the size of the memory dumped dsdt.dat. There this process simply did not work. For such cases use the Intel method instead. iv . Proceed to Step 2 to load your dsdt-modified.aml file. Here we load your dsdt-modified.aml as Windows registry DSDT override. Do note that an invalid dsdt-modified.aml loaded in this way can cause a BSOD on bootup. Furthermore, Windows test signing mode can be problematic for app compatibility. Both these issues can be avoided by using OPTION 2: Avoid test signing mode - load your dsdt-modified.aml as an in memory DSDT substitution. i. At Command Prompt (admin) type the following. WDK containing asl.exe must be installed per Step 1 (i) and (ii) for this to work. If get an error like below when do this, then disable SECURE BOOT in your BIOS. iii. Reboot your system and check for 'large memory' in step 3.
i. Disable the previous registry DSDT override and test signing mode. ii. check whether you are using a MBR or UEFI Windows installation by viewing Device Manager->Disk Drives->[double-click boot drive]->Volumes->Populate->Partition Style. If it says "MBR", then it's a MBR install. If it says "GPT" then it's a UEFI install. This will determine which next step to apply. iii. [ MBR mode ] Load the dsdt-modified.aml as an in-memory substitution via nando's DIY eGPU Setup 1.35 in the next post. Update Feb-2019 >> Mac users are advised to use @goalque's automate-eGPU EFI instead of Clover to load your resultant DSDT override to avoid issue noted below in the BIG WARNING. BIG WARNING by nando4 >> @Goalque has correctly identified that Clover loads a DSDT table in firmware volume and as such can brick a Macbook as this user found. If you proceed with using Clover to do a DSDT override the you do so at your own risk!! For risk-adverse users it is suggested to simply do a DSDT registry override and persevere with Windows' test signing mode until other solutions are found and presented. - Download the Clover ISO file and install it by extracting with 7-zip (64-bit only) the clover.tar.lzma->clover.tar->clover.pkg->\EFI folder to s:\EFI. Be sure to use the the 7-zip interface to extract to s: drive as Windows explorer refuses to allow viewing of the s: EFI volume. - Copy your dsdt-modified.aml file as dsdt.aml to s:\EFI\CLOVER\ACPI\Windows, the directory Clover uses to preload it. If your source dsdt-modified.aml file is not in c:\dsdt then use this workaround to copy-and-paste it. Locate your dsdt-modified.aml file with Explorer, right-click, rename to dsdt.aml, right-click, copy. Then hit CTRL+ALT+DEL, task manager, File->New task. Explore the s:\EFI\CLOVER\ACPI\WINDOWS directory and paste it there. - Reboot via Clover -> Windows EFI menu and proceed to step 3 to confirm it worked. nando4 - HP ZBook 17 G2 + AKiTiO Thunder2 + GTX970. SUCCESS! Allocated the eGPU into 36-bit space. Mikeal - 2016 15" Macbook Pro + Razer Core + GTX1070. SUCCESS! Allocated the eGPU into 36-bit space. theitsage - 2016 13" Macbook Pro + AKiTiO Thunder3 + GTX980Ti. SUCCESS! Allocated the eGPU into 36-bit space. batist - 2013 15" Lenovo T540 + EXP GDC + GTX680. SUCCESS! Allocated the eGPU into 36-bit space. 1. I still have an error 12 with the 'large memory' area present. How can I fix it? Select PCI compaction->Run compact. When prompted for the scope select eGPU. Your result will be then be like shown in step 3 above, but you'll have the eGPU rather then the (example) HD8790M dGPU allocated into 36-bit PCI space. iii. Re plug'n'play the devices. Go into Device Manager -> Video cards, delete the eGPU. Also go into Device Manager -> System devices and delete the PCI Express Root Port x entries. Window should now be clever enough to re-allocate the eGPU into 36-bit space upon realizing there is insufficient 32-bit space to host it. - perform a registry DSDT override with test signing enabled as described in the above post. Do not that some apps are either problematic or refuse to run with test signing enabled. - perform an in-memory DSDT table substitution using nando's DIY eGPU Setup 1.35 pre-boot environment which eliminates the need to alter your registry or enable test signing as explained in this post. How to do a in-memory DSDT override using nando's DIY eGPU Setup 1.35? A c:\dsdt\dsdt-modified.aml file created at step1 above or downloaded from eGPU.io's DSDT repository. Check by doing a file size comparison like shown here. Setup 1.35 also does this check before loading your dsdt-modified.aml and won't load it f it doesn't pass. This prevents corruption of other ACPI tables which would cause a Windows boot to crash. To achieve a smaller dsdt-modified.aml file, incrementally remove sections listed below in your dsdt-modified.dsl (Intel method) or dsdt-modified.asl (Microsoft method), followed by a recompile with 'iasl -ve dsdt-modified.dsl ' or 'asl /Fo=dsdt-modified.aml dsdt-modified.asl ' respectively. Then re-do the file size comparison. i. remove unnecessary Linux and older Windows entries in the _OSI section of the file like highlighted here. ii. remove unused PEG0, PEG1, PEG2, used to host a dGPU. If do have a dGPU and intend to use it when your eGPU is active then keep PEG0. iii. remove non-existent LPT (parallel ports), COM (serial) and eSATA ports. iv. 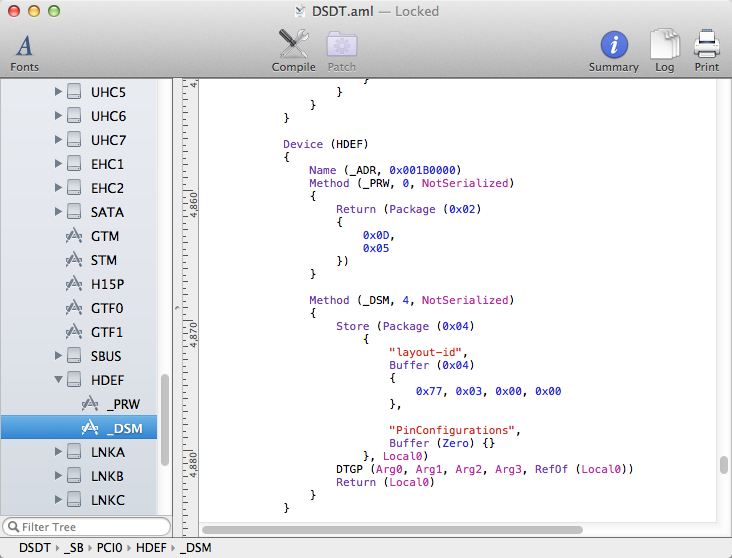 If have access to macOS, use MaciASL to compile your dsdt-modified.dsl. It creates a smaller dsdt-modified.aml. 2. Boot into nando's DIY eGPU Setup 1.35 -> automated startup via startup.bat (default). It will automatically load this dsdt.aml file and present the Windows bootloader where you then select Windows. Check for the 'Large Memory' area to indicate a successful in-memory DSDT override like shown below in View->Devices By Connection. Then check for error 12 against your eGPU.. Select PCI compaction->Run compact. When prompted for the scope select eGPU, force 32-bit=none. Yes. Below we see the new 'Large Memory Area' indicating the PCI BUS now extends into 36-bit PCI space with the iGPU (didn't have an eGPU at hand) relocated into that 36-bit space. Hello there! 🙂 no problem. @nando4 I still have the same problem.. the eGpu insists to connect to other Pci root port, instead the one created under the large memory... What should I do? I already unistall all the ports, the eGPU and the nvidia drivers, but it still not connect to the large memory..
Samuel, I think that Setup 1.35 should be able to fix that, because I believe you can force it to allocate the eGPU to the large/high memory area. I am not sure if there is a way to do it without Setup 1.35, but nando might know how to. If the eGPU won't auto-allocate to the 'Large Memory' area, then revert to using eGPU Setup 1.35 software to hard allocate it in a pre-boot environment. @everyone, the opening post is presented with an up-to-date DSDT override example using a 4th gen i-core Dell E6540. Unfortunately previous discussion was deleted along with the thread due to an offsite issue. Sincerest apologies there. Thank you Nando4! I was able to solve Error 12 on the 2016 15" MacBook Pro following your DSDT Override instructions. No BSOD and Large Memory shows up in Device Manager. Thanks @nando4, that did the trick It wouldn't run without setup 1.35 and compacting. After 2 days of tinkering with DSDT. I needed to cut "If (COND) FPED" statement and paste to where OS's are listed. Also added QWORD. Now that I know what I'm doing it's 2 min. For reference my config is HP 2570p (i5 3360m) - Win 10 x64 + Asus GTX 1060 6GB Turbo + EXP GDC V8 ExpressCard PCIe x2 + 8GB 1600Mhz. Witcher 3 on Ultra Avg 40-50FPS 1080p. In my experience with my X230 and an Expresscard eGPU, the latest Lenovo X230 BIOS has no TOLUD problems. My HD7950 worked with it without any DSDT overrides or any Setup1.3x remapping of the eGPU. As far as I know, though, the X220 never got such a BIOS update. Update Feb-2019 >>Mac users are advised to use @goalque's automate-eGPU EFI instead of Clover to load your resultant DSDT override to avoid issue noted below in the BIG WARNING. I have this working on a 2016 15" Macbook Pro MBP w/touch RX460 1TB with Clover loading a modified DSDT and the problematic Win10 test signing disabled. Thank you to nando4 for pointing out using Clover for DSDT link for UEFI installations, instructions in the opening post and formatting this post. 2. Reboot into macOS. Install / Load MaciASL. We will use MaciASL in MacOS to extract, edit, and compile the DSDT table. Search for "ResourceProducer". Beneath it will be a series of "DWordMemory" resource entries. Under the last DWordMemory entry in that area, typically above the _CRS method, add a 'QWordMemory' (64-bit) entry as shown in red below. The range chosen is in the 36-bit range (< 64GB) to maintain compatibility with the PAE-capable 32-bit Windows. A location above 48GB was chosen to alleviate issues with 32GB equipped systems. Here we use between 48.5GB to 56.25GB. Once systems start shipping with 64GB, this will need to be revised to 64-bit space. 9. Go back to the elevated terminal window‌ and copy your DSDL.aml file to /Volumes/EFI/EFI/CLOVER/ACPI/WINDOWS‌. Alternatively, use Finder to copy-and-paste your dsdt.aml file there. 10. Reboot into Clover, select Windows, /clap && open beer to celebrate full Windows (no test signing mode) & eGPU functionality with 'large memory' area in Device Manager to indicate DSDT override was a success. Update: I still have an error 12 with the 'large memory' area present. How can I fix it? Update: my internal soundcard doesn't work after applying this fix. What can I do? Just wanted to let you know how it went for me. I also have the late 2016 MacBook Pro 460. I tried Mikeal's method and it worked perfectly. After booting up, you can connect the adapter normally. It's kinda weird or maybe something wrong with my system allocation but the adapter somehow screws up the reallocation. Are you using the USB adapter on the same side the core is connected? I stopped using that one because I was having issues and thought it was because they shared the thunderbolt controller. I switched to a cheap ankar USB-C to 4 port USB 3.1 adapter on the other side. Even if the core side 2nd adapter was working for me, it got bad performance(Oculus complained about tracking). I have no problem running all 3 sensors and the Rift off the other side though. I have the Macbook pro 450 and I also use Mikeal's way to deal with the problem of the Code 12 Error. However, I have the issue of the DSDT compilation. Do you have this error: code 4096, unexpected PARSEOP_IF, expecting“,"or")"
If you have fixed the same errors, would you like to tell me how to do? Thank you. Are you using MaciASL as the editor? I had issues with other editors I used introducing errors, but MaciASL didn't show any. If you're following the reddit post for the guy that used the java client, he gave up and used MaciASL too he just didn't post about it. I just moved the offending if statement on it's own separate line as shown below. It compiled OK and theitsage confirmed (earlier) that loading the resultant dsdt.aml file as a registry override did result in the 'large memory' area appearing in Device Manager -> View -> Resources By Type, confirming it was a success. @nando4 I'm trying this DSDT override on a 2016 15" MBP but got 4 errors in Step 1. Can you give me a hand? I tried doing the windows way of modifying the dsdt and got roughly the same errors as other people reported. However, even when I fixed the error and and loaded it via windows method, I never could get rid of the error 12. The only way way I was able to get it working was via the Maciasl way, which, when I extracted and modified it, did not have any errors. i assume you did the windows way using the windows kit and all that? If so, I recommend doing via Mac OS side via maciasl and save some of the trouble I had to go through. Hope that helps. It does take some time to install and get maciasl working but it's a wayyyy smoother process. Okay; so I finally got Clover installed (the method I had to follow was not described in any of the above posts; so I'm not sure how you guys did it — I had to exercise some of my own knowledge of the UEFI boot-process, and re-arrange 1. the pre-existing Apple EFI programs, and 2. the Clover EFI program). The DSDT patch took, and I've got the aforementioned “Large Memory” area in the Device Manager. Unfortunately, this has changed nothing: the GTX 1080 is still Code 12'ing. I've tried the other above suggestions (right-click → ‘uninstall device’, checked the ‘uninstall drivers’ box, rebooted). No luck — after the drivers re-install, it's still Code 12'ing. Nothing appears to have been allocated to the “Large Memory” area. The DSDT patch took, and I've got the aforementioned “Large Memory” area in the Device Manager. Unfortunately, most of those tricks seem to be for MBR-formatted MacBooks? On new hardware like the Mac Pro and the 2016 Macbook Pro (like mine), Bootcamp doesn't create a hybrid-MBR; it sets up a UEFI boot of Windows. I'm running out of things to try! Okay, WTF: I get completely different results with each Thunderbolt port on my machine. Rear-left: The behaviour I've been describing thus far — the Razer Core is recognized, and my “NVIDIA GeForce GTX 1080” shows up, but Code 12's. Front-left: Against all expectations, this works! I get display output rendering from my card, and it shows up in the Display preferences! Rear-right, front-right: I just see a generic “Video Controller (VGA Compatible)”; Windows claims there are no drivers installed for it. So, it's a great step forward that it renders, at least from one port; unfortunately, that port isn't reachable from the final install location of my Core (damned short Thunderbolt 3 active cabling!) … so I gotta figure out why the right-hand ports are crashing Windows. Hi nando4 and Mikeal，thank you for your guys' help and I can use my razer core now. And after many times tries, I want to say that the method of Mikeal is good and it is very easy to success. However, I still have the issue of the Step 9 which I followed first time but the error 12 still have and there was no large memory. I hope this can be helpful for some people. @ElliottCable I've had mixed results with the ports as well. The right side seems to work best for me, and running nothing else off that thunderbolt controller. That is where I originally had it plugged in. Using the other side gives me the VGA device showing as you had. Also the boot issue with clover might be because I previously had refind installed. Nice work figuring that out. I've added it to the opening post linking your finding. Would you mind including your eGPU + notebook specs in your sig? I'm curious if it was with an AMD or NVidia card that this worked with. Will do, full post on the Mac side with details. Edit though, this is with the startup.nsh script also! I got this working successfully after some finagling. Each port appears to act different. My back left port even allows for hot plugging! My only issue, which I'm hoping someone can help with, is I need to use the USB to access Clover every time. The large memory disappears if I skip booting through Clover on the USB (which makes sense if I follow how this works correctly), but it looked like 7-9 were supposed to enable Clover without the USB. If I didn't explain this clearly, I'd be happy to provide more explanation. To summarize, the Clover edit still requires the USB. Thank you for the help! Also, if there are any questions about how I got mine working, I'd be happy to provide information! Hitting OPTION before booting would presumably give the Macbook several EFI items you can choose. Just work through them one at a time until same Clover screen appears instead of Windows. It's unmistakeable when Clover boots. I am sorry for not explaining this better. When the USB is plugged in, Clover is a boot option when viewing the EFI items. However, when the USB is removed, the option disappears, and the only other option is the "vanilla" Windows option. I just checked, and the /Volumes/EFI directory gets deleted on reboot, which explains why Clover is not an option on boot. I do not, however, know what is causing macOS to decide to remove this directory. To be clear, after performing the steps there is a /Volumes/EFI folder, then, after reboot, there is no longer a /Volumes/EFI folder. @JasonConig, the /Volumes/EFI directory is only deleted because you were using it as a mount point. If you remake the directory, and remount it, all the same information will be in it. I copied the clover folder from the USB, into /Volumes/EFI/EFI/Clover. After you make the DSDT related changes copy that folder into /Volumes/EFI/EFI/boot. This will give you the clover boot loader option every time you reboot. If I want to go into OS X and I was last in windows, I reboot and hold the option key then select the macox drive (which is my only selection in that menu now). I subscribed to the thread now didn't realize I wasn't getting notified. Hi, I'm new here and I followed the steps and could successfully run the Akitio Node on my MacBook pro 13" early 2015 and could run games with no problems. But I found that after I had restarted my laptop, I received errors like IRQL_NOT_LESS_OR_EQUAL when starting up and had no luck getting it back to work ever since. Any ideas? If there is a mismatch between the DSDT override and your current system bootup state then this could occur. So.. reset NVRAM, disable the DSDT override and re-create it. Here's where it is useful to have the Clover method working as don't need to wrestle with recovering Windows back into a working state. @bryanangg, check the thread in my sig, the 13" 2015s are particularly fun. Try the methods there (whether you have an AMD or Nvidia) and feel free to message me if you hit any walls with those tries. I would get DRIVER STATE FAILURE or IRQ LESS THAN EQUAL often when trying to uninstall/install, reallocate the GPU after the DSDT override. I found this java-based DSDT editor that can make it a little easier to make the changes rather than trying to download microsoft development files and using command prompt. @nando4 thank you, I'm still in the process of setting everything up. I'm currently at the part of creating the startup.nsh file. I've installed refind and copied the file to its root. However, when I tried rebooting with the eGPU connected, Mac OS shuts off but the laptop doesn't boot, it hangs with just a black screen. Connecting the eGPU at the windows loading screen also freezes it, the loading circle goes on forever. How do I set this part up? I have a problem with the DSDT in-memory override using the DIY eGPU 1.3x Setup. I am using a Lenovo edge 560 with a GTX 770 and EXP GDC v8 and Windows 10. Everything is working fine if I ran windows in Test mode and use the DSDT registry override method. What I have to do according to the guide is : I have to copy the .aml file into the V:\config folder, then disable testmode, restart and use the startup.bat option. If I do that windows start without Test mode but there is no large memory. My startup.bat file only runs the ”:OS” and “call chainloader” commands. I’ve read this post https://egpu.io/egpu-setup-13x/ and there is a “call loaddsdt” command, I tried to add that to my startup.bat but I got an error that “loaddsdt” is not a valid command. Do I need that command at all? can it be because I am using 1.31 and not 1.35 or did I forgot a step somewhere? @bryanangg did you get the eGPU setup and working fully in OSX first? Do I need that command at all? can it be because I am using 1.31 and not 1.35 or did I forgot a step somewhere? I've emailed the 1.31 to 1.35 update with instructions. 1.35 loads the DSDT override as you require.